Whenever the legend “Inspired by actual events” opens a film, viewers will wonder just how much of what they are about to see actually happened. We’ll get to what’s actually known about the real life event on which this film is apparently based later. First the particulars. 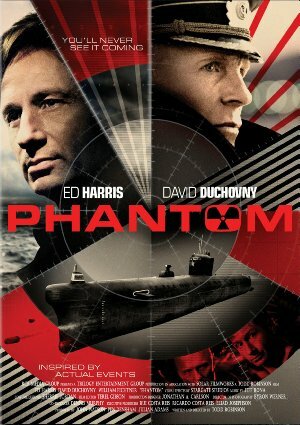 Ed Harris is “Demi” a Soviet submarine captain in the late 1960s. He is being forced to retire because of something that happened long ago. Only his father’s standing in the Soviet Navy and the Party kept him from being forced out right then and there. He is under the command of “Markov” (Henrikson) who bears a long-standing grudge against him. Demi and his crew are just back from an extended mission at sea and were looking forward to several weeks of rest. Markov says that will not be the case, as they are being ordered back out. Demi’s sub needs major repair work, but Markov has another sub for him. It’s a broken-down diesel sub that has had some secret modifications. Demi goes to where his officers are gathered to celebrate the wedding of “Sasha” (Gray-Stanford) and gives them the bad news. Not all of his crew can be located in time to sail as scheduled, so replacements are found for them. First officer “Alex” (Fichtner) discovers that only one of the replacements appears to have personnel records and that man was listed as dead. Then things turn dark when “Bruni” (Duchovny) and “Garin” (Magyar) come aboard to oversee the “classified” component of the mission. Clearly they have served in the Soviet Navy, but now work for some secret arm of the KGB or GRU. As you’ve probably seen in the film’s trailer, at one point we hear Demi saying “there are only two reasons why a boat would go rogue. One is to defect and one is to start a war.” It’s obvious from the beginning that what Bruni and Garin are planning isn’t to defect. They are far too patriotic for that. They are planning to test a piece of secret equipment and then react in a paranoiac way to some intelligence about U.S. capabilities they’ve come into possession of. They take control of the ship and lock up the Captain and his crew. Sound familiar? There are a number of things in any submarine-themed movie that will be derivative of the films that preceded them in the genre. It’s unavoidable and it isn’t a flaw. Just that there are only a certain number of directions some of the elements of a movie where 95% of it is shot inside a sub. There is more than adequate tension and some superb acting by Harris and Fichtner that elevates the script to a higher level that might have otherwise been achieved. The ending is a bit hokey but understandable. Now on to what really happened. K-129 was a diesel-powered, ballistic-missile submarine that disappeared while on a mission in 1968. It was assigned to the base portrayed in the film’s opening sequence. A massive search was conducted that year by the Soviets but they didn’t find it. The U.S. did and you may have heard of the CIA’s special ship “Glomar Explorer”. It was built specifically to try to salvage the K-129. What happened with the actual salvage operation remains classified to this date, which lends credence to the theories of many that there is little connection between Phantom the film, and what really happened. Odds are good we will never know.